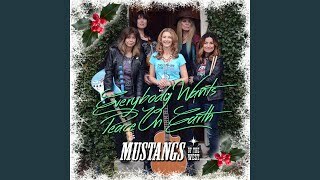 EVERYBODY WANTS PEACE ON EARTH, the new holiday single from California country/rock band Mustangs of the West with its hooky, sing-a-long chorus and layered harmonies, will find its way into your head and heart this holiday season. Written by band members Sherry Rayn Barnett, Holly Montgomery and Suzanna Spring, the song reminds us that peace begins at home, one voice can make a difference, and love still has the greatest reach. In the spirit of John Lennon and Yoko Ono’s “Happy Xmas (War Is Over)”, EVERYBODY WANTS PEACE ON EARTH is destined to become a new original traditional. George Landress co-produced the song with the band, working at Stagg Street Studios and at his private studio to finish out lead vocals. Fiddle player/vocalist Aubrey Richmond added her fiddle parts and co-arranged some beautiful layered background vocals, Barnett added her jangly electric 12-string signature sound, and the driving rhythm section of Holly’s bass along with drummer Suzanne Morissette gave this song its full dimension and drive. The song came together quickly, with harmonies and a sense of joy that listeners will take to heart and want to join in singing this season. Listen to the song on Spotify, Amazon, Apple Music/iTunes (by clicking the option). Follow the Mustangs of the West on Instagram, Twitter and Facebook!